Living A Whole Life: What Does Whole Grain Mean? Many years ago the push toward eating more "whole grains" began and wheat flour bread replaced the white bread of a generation ago. What does it really mean and why is it important to eat "whole grains"? I thought I would try to touch on that topic today. There is so much information out there, but I would like to explain to you what a whole grain is, why it's important, and what milling and refining do to whole grains. Grains are basically seeds of the plant they come from. They contain three basic parts as you can see from the diagram above. The bran, endosperm and germ. The bran is the tough outer coating that protects the grain. It contains several layers which contain minerals, fiber, and significant amounts of B complex vitamins, trace minerals, and phytonutrients. The endosperm is the starchy bulk of the grain which nourishes the seedling during its early growth before it's leaves have begun photosynthesis. The endosperm is made up of starch granules packed into tiny compartments, the walls of which are mostly protein. The endosperm also contains a few B-vitamins. The germ of the seed, upon germination and sprouting, gives rise to the first tiny leaves and rootlets. The germ contains contains vitamins, oils, and proteins and is especially high in essential fatty acids, vitamin E, B-complex, and trace minerals. Milling, refining, and processing rob the grain of it's nutrients in two very important ways. Most of the time when a grain is milled and processed to make bread, the bran and the germ are discarded and bread is made from the endosperm. The bran is discarded because it's tough and fibrous and will make bread more dense and hard. The germ is discarded because it contains oils that will over time become rancid, so discarding the germ will extend the shelf life of the product. Here is the problem with this though. The bran and the germ contain the most nutrients and the endosperm contains energy the body would use to assimilate these nutrients. So, when you discard the nutrient rich bran and germ, you are left with alot of empty calories. Some estimate that as many as 22 natural vitamins and minerals are removed through the milling process. When purchasing bread, don't just look for wheat or oat flour. 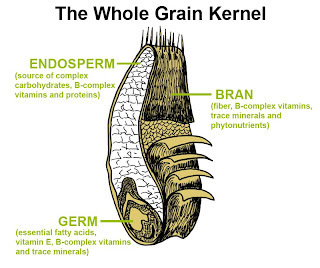 Instead look for the word "whole" preceding the type of grain. For instance, whole wheat flour, whole barley flour, or whole oat flour. Grains are fantastic storage food. A grain can lie dormant for a very long time and with it's hard outer covering, all the nutrients will be intact. When a grain comes into contact with moisture or is cut open and air hits the germ and endosperm, the seed comes to life and if it isn't planted it dies and the nutrients are lost. At the moment you cut open a grain you have the most nutrients possible and then they slowly decay and become useless. How long has your whole grain bread been sitting on that grocery store shelf? How long have those whole grain crackers sat in your pantry? This was startling to me when I thought about all of the organic "whole grain" breads, crackers, and cereals I had been buying and how very little actual nutrition they probably contain. It is better to consume your grains whole and unprocessed. Another good thing to do is to find a mill that will mill your grains for cooking or cereal before you purchase it. Even better, get your own grain mill and buy whole grains. Refrigeration will slow the decay process, so it is good to refrigerate your milled grains and cereals. I'd like to add to this post in the future by telling you more about the types of grains. They are not all created equal and rotating the whole grains you eat will provide the best variety of nutrients. I would also like in the future to discuss sprouting of whole grains and give you more recipes to try. For now, check out this great Quinoa and Lentil salad and lets all work on eating more whole grains and benefiting from the awesome nutrition they offer us.